Incendiary kites from Gaza and a heat wave blamed for numerous wildfires countrywide. Incendiary kites flown by Gaza terrorists and a heat wave are among the reasons being cited for numerous wildfires that have been raging countrywide Friday. The incendiary kites – a new terror technique that is currently in vogue in Gaza – reportedly set Jewish-owned agricultural fields on fire near Kibbuz Sa'ad and Kfar 'Aza. Due to the fire that broke out in the Elad area, planes from Ben Gurion Airport took off only with the approval of the fire and rescue services, causing delays in air traffic. 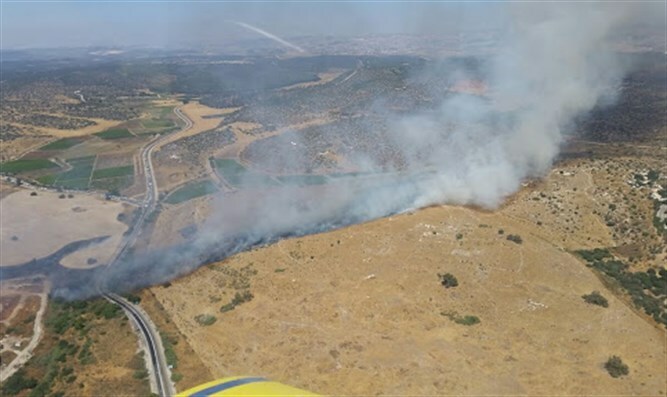 Following the brush fire in the Yarkonim area, Highway 5 was blocked from the Hatikva interchange to the Yarkon interchange in both directions. Route 4613 in central Israel is also blocked in both directions. Some residents of Givat Koach were evacuated from their homes. Firefighting planes are assisting the fire engines on the ground in combating the flames. A blaze wiped out 6,000 dunams (roughly 1,500 acres) at the Nahal Habsor Nature Reserve in the South. Much damage was reported, and much of the wildlife in the reserve reportedly fled or died. Fires also broke out at Nahal Soreq, in the Yarkonim area and near the railway at Lehavim, in the Negev. Train movement between Kiryat Gat and Be'er Sheva North was halted and buses were brought in to ferry the passengers who had been hoping to take the affected trains.